William Henry Dethlef Koerner was born in Lunden, Germany on November 19, 1878 to Anna Margaretha Wilhelms and Hans Henning Wilhelm Koerner. William along with his younger sister Auguste were the only two out of twelve children to survive infancy. In 1880, the Koerner family emigrated from Germany to the U.S., eventually settling in the rural midwestern town of Clinton, Iowa, where a rather large German community had already settled. 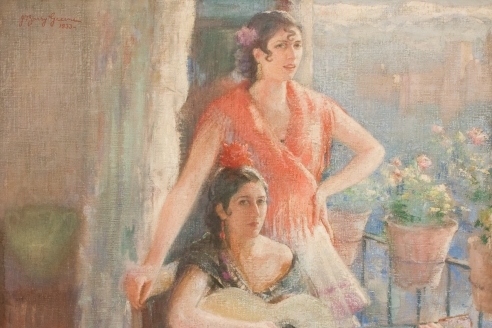 As a child, Koerner showed an early interest and talent in art. He even got a job painting cows on milk wagons earning a five-dollar stipend per wagon. In 1898, at the age of twenty, the young artist sold watercolors and oil paintings to earn enough money to eventually move to Chicago. Once settled there, Koerner began working as an illustrator for the Chicago Tribune, and earned a salary of five dollars per week. By 1902, he had already earned the title of Assistant Art Editor and was making forty-five dollars per week. Despite a flourishing career and growing reputation as a rapid hand sketch artist, Koerner was still very interested in furthering his education and training. While in Chicago, he attended classes at both the Chicago Art Institute and The Francis Smith Art Academy of Chicago. It was at this time that he met his future bride, Lillian Lusk, who was also an art student at the Art Academy. In 1903, the two married, and moved to Lillian’s hometown of Battle Creek, Michigan, where Koerner held a brief job at Pilgrim Magazine. 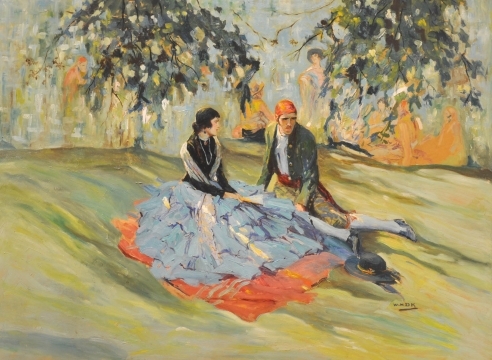 By 1905, the young couple had saved enough money to move to New York, where Koerner attended the Art Students League until 1907. Koerner's resume was expanded even further when he moved to Wilmington, Delaware to study under the "Father of American Illustration," Howard Pyle. Under Pyle's tutelage, Koerner developed an early style characterized by boldness and precision, as well as a heroic and adventurous spirit. 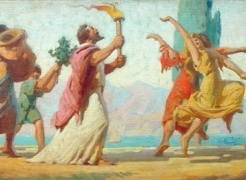 He studied under Pyle until 1911, at which point Koerner had established himself as a very talented and capable illustrator. He held many jobs illustrating articles and covers of many popular magazines, including The Saturday Evening Post, McCall's, Redbook, Harper's, Good Housekeeping, Collier's, Pictorial Review and the Ladies Home Journal. Koerner would eventually, however, refuse to illustrate any "pink tea stories," and from 1929 until the end of his career, would work exclusively for The Saturday Evening Post, a publication he had worked on and off for since 1909. These years were not only successful for his career but for Koerner's family life as well. William’s and Lillian's first child, a daughter named Ruth Ann was born in 1913, and followed two years later by a younger brother, Bill Jr. The Koerner's also moved to Interlake, New Jersey in 1919, where they had not only a home, but a studio which housed a majority of Koerner's works as well as his collection of western artifacts. The Koerners would remain in Interlake until Bill's death. WHD Koerner passed away in 1938, at the age of 59 from a cerebral hemorrhage. 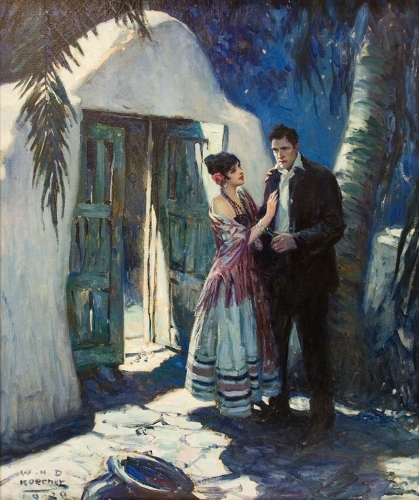 At the time of his death, the artist had received commissions for over 500 paintings and completed drawings for more than 200 western-themed stories. His studio, which still remains intact, can be viewed at the Buffalo Bill Historical Center's Whitney Museum of Western Art in Cody, Wyoming. WHD Koerner showed an interest in drawing at an early age. As a child he painted images of cows on milk wagons for five dollars each, and as a teenager, he enrolled in art school in his home town of Clinton, Iowa. Koerner also studied at the Chicago Art Institute, and Francis Smith Art Academy as well as the Art Students League in New York. However, his time spent studying under “the father of American illustration” Howard Pyle (1853-1911), proved to be the most important move in his young career. 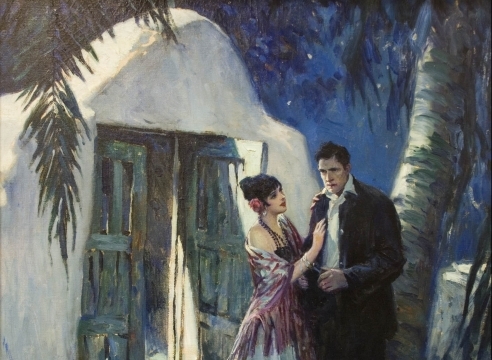 Under Pyle's tutelage, Koerner learned the importance of imagination over model in his art. He was also encouraged to create images that amplified the fictional narrative on which they were based. Koerner always insisted on producing commissioned images on vibrantly colored canvases, even if they would only be reproduced in black and white. He was also known to mix his mediums, combining watercolors, oils, pastels, charcoal, colored pencils and crayons. Working for The Saturday Evening Post, Pilgrim, Redbook and Harper's, his career as a magazine illustrator flourished. He even illustrated early advertisements for C.W Post's Grapenuts, a product still familiar today. Another mentor, artist Hugh Breckenridge (1870-1937) would greatly influence Koerner's later works, specifically his use of brushstroke and color. Breckenridge had pioneered the technique of the use of 'broken color' in which bold strokes of color would be placed next to and separated by strokes of a different color, resulting in a sort of Impressionism. Koerner's images can hardly be done justice in the form of republication, and especially not in black and white. His colors are extremely vibrant and bold. Koerner House, Rocky Neck, Gloucester, Mass. (1922) is a good example of these vivacious tones. His bold strokes of yellows, oranges, purples, blues and greens give the work a heightened appearance. Although Koerner House lacks the movement and adventure so prevalent in some of his other works, he has managed to emphasize and exaggerate the light in such a way that the work becomes active and exciting. The colors appear to melt all over the canvas, activating our imaginations with this seemingly leisurely scene. With such an emphasis on light, the work can not help but glow. Other works such as Comin from Behind (1925), an oil on canvas, and Boiling Over (1925), another oil on canvas, come alive with the help of a great sense of movement and adventure brought out with a fantastical palette and landscape composition. Comin from Behind depicts the popular sport of horseracing at its most active. The horses’ body language as they race along the track, as well as the billowy clouds of dust they kick up behind them heightens the quickness of the race, and even gives the viewer a sense of an adrenaline rush at the thought of such speed. Boiling Over gives us a view of an all-American family, complete with dog, driving their car through the countryside. The grass is a vibrant green, and the horizon line is colored with subtle pinks and light oranges. This family could be going out for a leisurely drive just as easily as they could be making their way to California in search of work in the midst of the Great Depression. Whatever their destination may be, they are truly living the American ideal of exploration, adventure and hope. Both of these pieces show an extreme sense of detail and great precision. They look like they could be works commissioned to go along with a specific story, just as easily as they could be general representations of the time and place in which they are set. 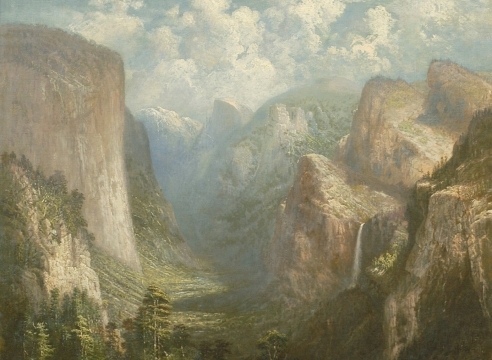 WHD Koerner's paintings and illustrations epitomize the ideal of the American West as a place of adventure. Koerner began his career as a rapid-hand sketch artist, and although he was known for producing his paintings and sketches rather quickly, they are painstakingly detailed and rough, with a great respect for Realism. His decidedly bold images also exhibit a strong sense of ruggedness, challenge and excitement. 1. Koerner, W. H. D. ASKART.com. 2. Tachick, Julie Coleman, WHD Koerner: In My Mind’s Eye,” An Artisit’s Approach, Points West Online, Fall Issue, 2002. 3.W.H.D. Koerner 1878-1938. First New York Exhibition. Kennedy Galleries, INC., New York: 1964. 4. W.H.D Koerner and Montana. The Montana Historical Society in association with Ruth Koerner Oliver: 1971. 5. W.H.D. Koerner: Illustrator of the West, Los Angeles County Museum of Natural History, 1968.